Workhouses were controversial. On one hand, they offered food and shelter to the poor and infirm, but on the other they were authoritarian, sometimes brutal and expected those inside who were capable to work hard…very hard. In Southwell, you enter the workhouse through some of the old outbuildings where you can watch a video, which is well worth seeing. You then arrive immediately in the women’s courtyard. At the centre stands a water pump, which still works, and you’re welcome to have a go! On arrival at the workhouse, families were split up and segregated. No mixing of the different groups was allowed and as such, the building is split into separate zones. There’s an area for infirm men – those who couldn’t work, an area for able men, an area for infirm women and an area for able women. There is also a school room where the children were educated. Standing in the centre of the building are the manager’s quarters along with a huge meeting room, where the ‘sponsors’ of the workhouse would gather to review progress. In the areas where residents lived and work, the walls and floors are sparse and functional, but the areas where the sponsors met or the manager’s family lived are much more luxurious. As an attraction, this place is fascinating. No original furniture survived, so many rooms are left bare. We though this was a shame and reproduction furniture would have helped to visualise what kind of conditions people lived in. As such, the audio guide is essential in bringing the place to life. It’s included in the price, but does tend to go on a bit. We got fed up of the ‘acting’ parts of it and just wanted to know what each room was used for ad how people lived who were in it. All in all though, the Workhouse is great value for money with adult admission at £6.80 (2013 prices). It’s open Wednesday to Sunday from 12pm to 5pm for most of the year, although it closes completely for most of November, December & January. 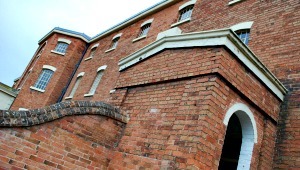 The Workhouse is signed from the A612 and throughout most of Southwell Town Centre.